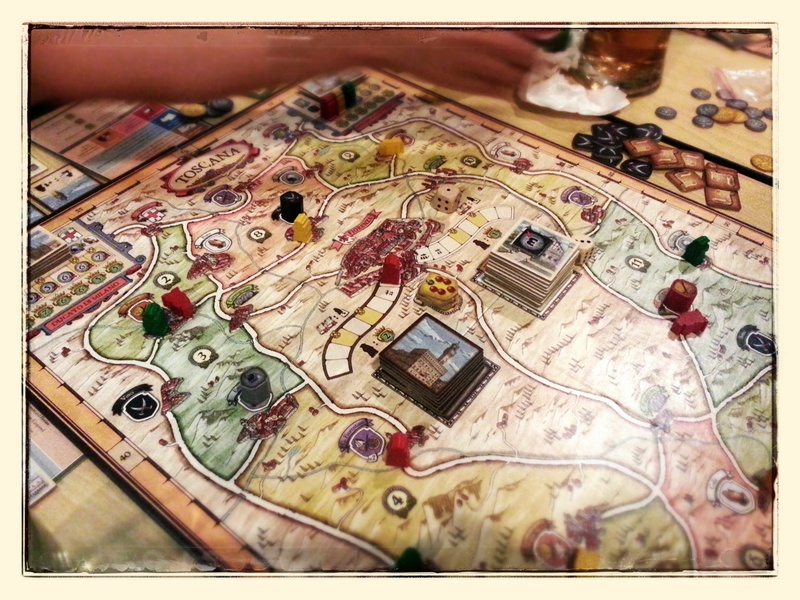 Last meetup I played a 3-player game of Il Vecchio. A friend brought the game and explained the game. I already heard about the game and read the rules a while back, but of course I already forgot it by this time. As far as I can remember, the rules are quite simple and easy to understand, which at that time, I thought it to be a too simple game for my liking. Il Vecchio is a Euro game designed by Rudiger Dorn (the one behind Goa, Las Vegas, Jambo, Arkadia, etc), published by Pegasus Spiele on 2012. So we started the game by setup all the components, while my friend explain the game without referring to the rulebook and he’s done it nicely. Bravo to my friend! After 10-15 minutes preparation and rules explanation, we ready to play. The game is simple, players collect points by placing his / her workers on three red towns (provinces), you can found these provinces, two on top of the map and one at the bottom of the map. In each of the province, there are several slots to place workers. These slots have different costs and points, The lowest cost slot has highest point while the highest cost has the lowest point. The key is to place workers as fast as you can into slots with cheaper cost and high points. Beside paying the cost players need to pay the requirements in the form of followers. To gain followers, players need to collect the followers token throughout the towns in the game board. Players will get initial placement of 4 workers in 2 different regions (there are 12 different regions on the board) by rolling two six-sided dice, every region is number from 1 to 12, except there is no number 7. As like as Settlers of Catan, 7 is the lucky number, and each time a player rolls a 7, he / she can place his worker from the supply to a town in any region. In the game, players will take turn to carry out one action out of the available five actions: take a town action (collect tokens), take over a province (gain a province tile), assume an office in Florence (gain a Florence tile), Reinforcement and Recovery. Taking a town action is basically using your active / standing worker to collect follower tokens on towns that have middleman crest or 3 coins on green towns. After complete the action, that worker is laid down to show inactive status. If there is a crest on the activated space, that crest is moved into the next available slots in clockwise order. Taking over a province action is to place one of available worker to the province by paying the requirements and cost depicted on the slots. And then choose one available province tiles. These province tiles are useful in the game effect once after one time activation or at the end of the game for points. Assume an office in Florence require a worker to travel into Florence (at the center of the map) and pay 2 scroll tokens and 3 coins if required. By doing this, player places the worker into one of the two offices, City Council or Nobility. After that, the player may draw 5 tiles from the corresponding office and keep 1. This tile provides in game benefit throughout the game or special scoring at the end game. Reinforce is the most common way to place worker from the supply to the map. A player roll 2 dice and sum the total. He place 1 worker from the supply to a region numbered as the total. If he rolled 7, he can place the worker in any region. Recover. Players may use this action to stand their all laid down workers or inactive and gain 1 coin. In taking these actions players may travel their worker by paying 1 coin for each town they move. When a worker is placed upon slot that has a Medici symbol (slot on the provinces and offices), the Medici event is triggered. An event tile is drawn and resolved. When the stack of the event tiles is depleted, each other will get the one turn and then each player get 2 immediate subsequent turns before the game ends. At the end game, players count their scores based on province majority and Nobility tiles. It’s a simple game really, it has the combination between Settlers of Catan with the 12 regions and 7 for the lucky number and also collecting resources is pretty straight forward. The game last for 45 minutes. This game is all about placement of your worker, timing activation and racing to take over provinces. Though somehow it looks simple, the collect actions are pretty essential. Player must consider the movement of the crest. If it moved to a place where is a worker of other players, that player gain the benefit for activating / collect the tokens without traveling. So, you need to consider, is it safe to take the action or maybe you’re giving it to other player. The City Council tiles also give players in game effect and based on my first play, some of the tiles are powerful if you get it as the starting tiles. If you did not get it, well, you’re not that lucky. Speaking of lucky, I mentioned that there is a share mechanic between this game and Settlers of Catan. Unlike Settlers of Catan, which dice rolling could be crucial, game breaking (which supposedly mitigated by the negotiation element), in this game, the random roll element is mitigated by the travel action. Even if your worker is placed somewhere you don’t want it to be, you can travel to other destination by paying 1 coin per movement. With this, you don’t depend your luck with the dice rolls. Overall I like the game, simple but intuitive. Here are some pros and cons about the game that I managed to find during my first play. – Simple game play and rules.